the event coordinators have suggested we wear etsy apparel and i have been thinking of what in the world i could wear? eureka! i think all my pockets may need this treatment. 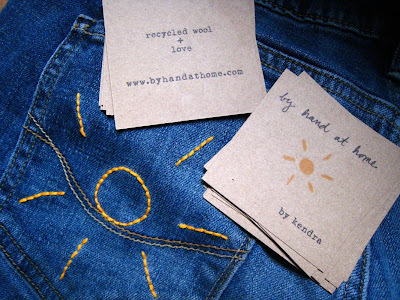 i went with the tag 'recycled wool + love' on these business cards, because it is my favorite material to work with in craft. but i really really really love doing a little bit of everything! crochet, embroidery, knitting, toys, apparel...and more to discover, i'm sure! i know there are other crafters out there who have more than one 'niche', yes? i've been reading tara's advice on scoutiegirl and diane's advice on craftypod, and i think my next step is to cultivate a mission. but i want to include everything! anyone else figured this one out? do tell!